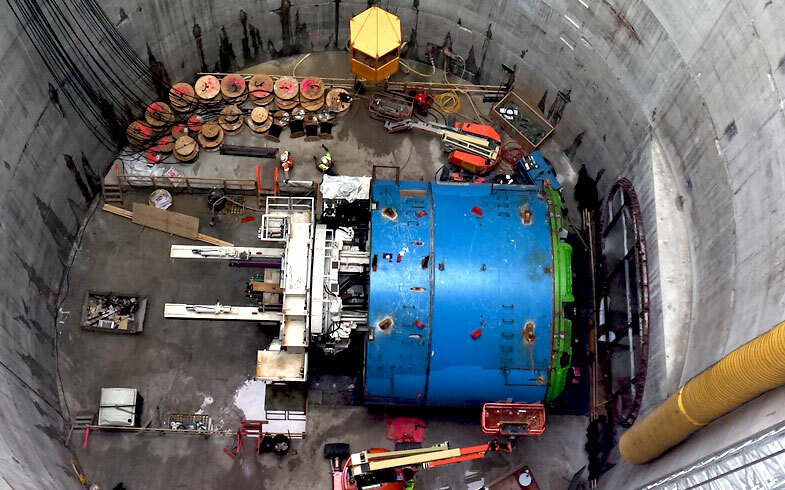 Deep within the earth, they provided electrical support that powered Lucy Diggs Slowe, the gargantuan tunnel boring machine, 27 feet in diameter and a city block long, that dug the tunnel under First Street as part of DC Water’s Clean Rivers Project. This $157 million portion of a $2.6 billion project will help reduce flooding in Washington’s Bloomingdale neighborhood and improve water quality in the Potomac River by ensuring that storm water is treated before it is released into the river. Currently, heavy rains drop too much water for the water treatment system to handle. Combined sewer overflow pipes mean that as the excess storm water flows into the Potomac, it mixes with raw sewage. The Clean Rivers Project is mining four tunnels to reroute water to D.C.’s Blue Plains treatment system and, when needed, to provide temporary storage tanks such as the one under First Street. Lucy was assembled on site, aboveground, by Leyden Electric in Elburn, IL, and Chicago-based IBEW Local Union 134, which specializes in tunnel projects nationwide. They teamed with members of IBEW Local 26 for this project. This massive mining machine requires complex wiring. The workers test high-voltage wiring, troubleshoot the controls, and tech check the motors: anything that is needed to keep things running. They worked with a wide range of voltage, from 12 to 13.2. Following Lucy and spurring her to dig was a 13,000-volt extension cord. The working conditions made for a different kind of project. Teams head below ground in the morning and don’t emerge until 10 or more hours later each day. Working under those conditions day in and day out, the electricians joined in with the miners and machine operators to work as a team and keep Lucy online and on grade. “After a while, we became like family,” said Leyden. This teamwork may also have been a factor in the project finishing on time.